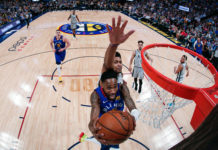 The Denver Nuggets — winners of six-straight games and the current occupant of the first seed in the Western Conference — have continued to find ways to win despite less than ideal circumstances, but they were to be put to the test in the Motor City against the Detroit Pistons. Those less than ideal circumstances that Denver is dealing with has much to do with their ever-constant injury issues. Will Barton missed 38 games to begin the year with a groin strain that required surgery. Paul Millsap missed eight games with a broken toe on his right foot and missed his ninth game in Detroit due to right ankle soreness. Gary Harris was officially ruled out the day before taking on Detroit and has now missed 21 games split between four different lower body injures; a right hip issue, a right groin issue, an ankle issue, and left hamstring tightness. Oh, and all of these injuries are in additional to both Isaiah Thomas and Michael Porter Jr. missing the entirety of the season. As the Nuggets continue to deal with a constantly transitioning rotation, they have to rely on their reserves to continually step in for Denver’s injured players. For the third straight game, Monte Morris and Malik Beasley will be the ones to step into the starting lineup with Harris and Murray sidelined. 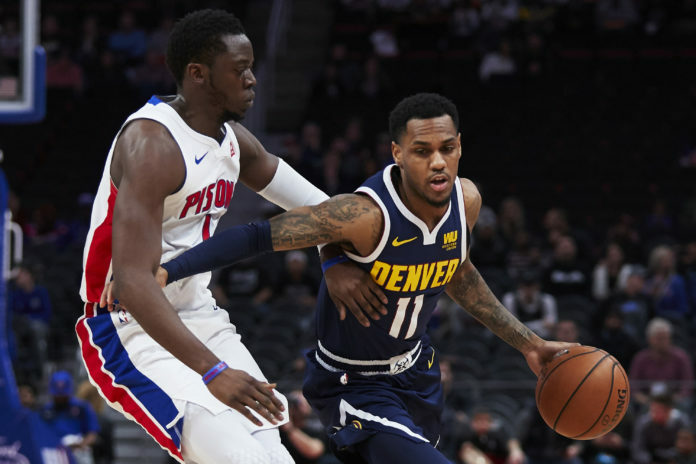 Unfortunately, Denver had been red-lining the very few healthy bodies they had left for the past couple of months and it resulted in a clearly exhausted Nuggets team losing to the Pistons by a score of 129-to-103 in Detroit. Defense was optional from the second the opening tip was tossed up. The Nuggets had 25 points in the first six minutes of the game as Jokic was orchestrating a symphony on the offensive end of the floor. The main benefactor of Jokic’s brilliance was none other than Beasley, who has been virtually automatic from 3-point range. His hot shooting continued in Detroit as he hit all three of his 3-point attempts in the frame. While the Nuggets were getting hot from 3-point range, so were their counterparts. The Pistons hit six 3-pointers in the first quarter which kept them in the game. 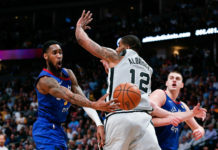 The Nuggets and Pistons combined to shoot 10-of-18 from 3-point range over the first 12-minute period which resulted in a high-scoring start to the game. Once the first quarter had ended, the Nuggets led 36-to-34. The second quarter began terribly for Denver. With Millsap out and Plumlee being in the starting unit, Malone inserted Tyler Lydon, who has been a mainstay on the end of the bench all season. Lydon proceeded to blow multiple defensive rotations, was getting blown-by on the perimeter, got his only shot attempt blocked and, in his three minutes of action, the Nuggets were outscored by ten points. 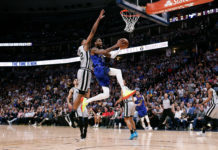 Once the Nuggets went back to their starting unit, they began to dig themselves out of the hole that their ravaged bench unit provided them, but there was not enough time for Denver to take back the lead. After giving up aa 10-0 run and a 14-0 run in the first half, the Nuggets went into halftime trailing 68-55. The third quarter began with some life for the Nuggets, but once Jokic picked up his fourth foul with just over six minutes left in the third frame and went to the bench, things went from bad to worse for Denver. They were unable to convert offensively, were completely lifeless defensively, and were unable to win any of the hustle categories. Denver was playing their fourth game in six nights and their play mirrored their exhaustion. Even though Denver was playing on very tired legs, their bench unit — led by Trey Lyles, Morris, and Plumlee — injected some life back into the game for a brief moment. They refused to quit and were slowly chipping away at their deficit, but then Andre Drummond started overpowering any and all bigs that Denver thew his way. In the third quarter alone, Drummond had 14 points thanks to five offensive rebounds. Denver’s defensive deficiencies were too much to overcome with Jokic in foul trouble in the third quarter and it led the Nuggets carrying a 14-point deficit into the final 12 minutes of the game. Denver allowed 97 points through three quarters and the Pistons finished the third quarter with a 97-83 lead. In the fourth quarter, things went from worse to downright terrible. The Pistons extended their lead as high as 24 points and Denver had no answer. Once the game mercifully ended, Denver had sustained their 16th loss of the season by a score of 129-to-103. By the time the final buzzer sounded, Jokic, after dealing with foul trouble, only managed to accumulate 16 points, three rebonds, and four assists. Morris — a Flint, Michigan native — had 18 points on 8-of-13 shooting in his homecoming game as his high school coach and family watched from the crowd. Beasley continued his hot shooting with 16 points on three made 3-poiners. Lastly, Lyles had a strong night as he racked up 20 points in 29 minutes on 8-of-13 shooting. For Detroit, Drummond had 27 points on 12-of-14 shooting to go with 12 rebounds. Next, the Nuggets will continue their four-game road trip in Brooklyn against the Nets on Wednesday night. Denver will be looking to grab their 15th road win of the season and, if they can overcome the Nets, they will have already tied their number of wins on the road from last year. That game will tip off at 5:30pm MST on Wednesday, February 6th.